Sackets Harbor, NY - Representatives from across the Great Lakes Seaway Trail byway that parallels the Saint Lawrence River and Great Lakes shoreline were recently among 43 tourism representatives on an I Love New York marketing campaign in Canada. The New York State Empire State Development Corporation Division of Tourism organized the campaign that stopped in Toronto, Ottawa, and Montreal. Thomas Ranese, Chief Marketing Officer for Empire State Development Corporation, said, "Canadian travelers are a key source of our tourism revenue, with more Canadians visiting New York each year than any other state." Teresa Mitchell, president and CEO of the Great Lakes Seaway Trail, Sackets Harbor, NY, spoke to a Toronto-based gathering of travel writers and travel packagers about the birdwatching, maritime, historic, outdoor recreation, and leisure touring opportunities along the 518-mile-long leisure driving route that is one of America&apos;s Byways and a National Recreation Trail. Gary De Young and Tillie Youngs of the 1000 Islands International Tourism Council promoted the vacation and relaxation resources of the 1000 Islands region with members of the Canadian press and travel industry. Ellen Nesbitt of the St. Lawrence County Chamber of Commerce shared information on New York&apos;s largest county that reaches from the St. Lawrence River to the Adirondack Mountains. 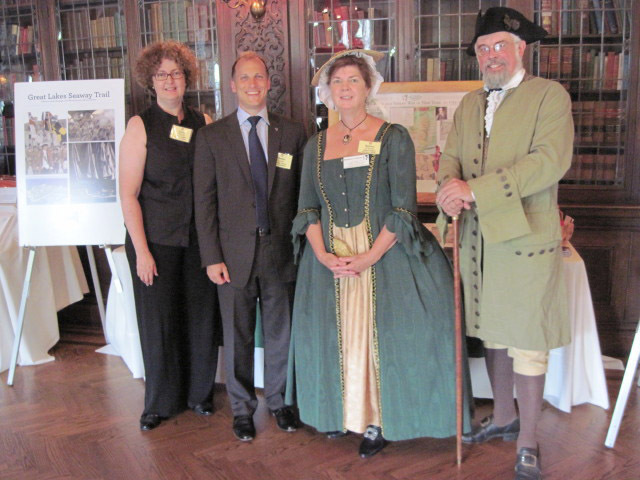 New York State French and Indian War 250th Anniversary Commemoration Commission members Nicholas Westbrook (Vice Chair) and Barbara O&apos;Keefe, president of the Fort la Presentation Association, appeared in period costume to promote the 2010 and final Signature Event of New York&apos;s commemoration of the 250th anniversary of the French and Indian War. The event will be held along the Great Lakes Seaway Trail in Ogdensburg at the site of the historic fort built in 1749. Among the other Great Lakes Seaway Trail destinations represented on the tour were Oswego, Rochester, Buffalo, Niagara Falls, the Strong National Museum of Play (Rochester) and Whirlpool Jet Boat Tours (Lewiston). According to the U.S. Dept. of Commerce, Canada is the largest inbound travel market for the United States, accounting for 32% of international visitors and 13.14% of visitor spending in 2008. Canada ranks first in visitors to the U.S. (18.9 million); first in spending (US$ 18.7 billion). According to Statistics Canada, a statistical consulting group, the number of Canadian tourists staying overnight in New York State grew 31.5% between 2004 and 2007, the most recent year for which figures are available. A slight decline in visitor volume from Canada to the U.S. is expected in 2009 due to the economy and exchange rate, however, in 2010 the forecast is expected to rebound and Canadian visitation to the U.S. may meet or exceed the record of 1991, which was 19.1 million. For information on traveling along the Great Lakes Seaway Trail, go online to www.seawaytrail.com or call 315-646-1000. Contact: Teresa Mitchell, Great Lakes Seaway Trail, 315-646-1000 Photo Caption: (Left to right) Great Lakes Seaway Trail President & CEO Teresa Mitchell; Thomas Ranese, Chief Marketing Officer for Empire State Development Corporation; Fort La Presentation Association President Barbara O&apos;Keefe; and New York State French and Indian War 250th Anniversary Commemoration Commission Vice Chair Nicholas Westbrook participated in the recent I Love New York travel marketing campaign to Canada. They are seen here at Casa Loma in Toronto where they met with members of the Canadian media and travel industries.